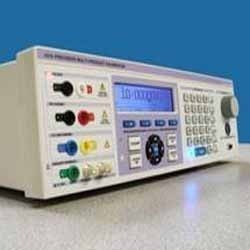 Leading Manufacturer of multiproduct calibrator from Chennai. We have set a benchmark in the industries for manufacturing and supplying Multiproduct Calibrator. Ideal for laboratory or field use, offered calibrator is designed by using optimum quality components and innovative technology as per the industry standards. Our provided calibrator is tested on varied quality measures so as to maintain its quality. In addition to this, we provide this calibrator in different designs and sizes at pocket friendly prices.